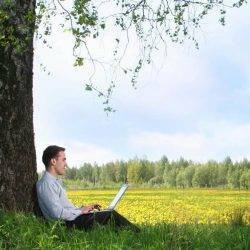 UK office workers spend an alarmingly limited amount of time outdoors each day, claims new research from Ambius, which found that almost 40 percent spend a maximum of just 15 minutes outside, excluding their commute to work, and an additional 22 percent spend a maximum of 30 minutes outside. This is even less than prisoners, who require ‘at least one hour of suitable exercise in the open air daily’, according to UN guidelines. On average, the British workers surveyed spend more time per day at their desk or workstation (6.8 hours) than they do in bed (6.4 hours), relaxing at home (3.5 hours) or outdoors (37 mins). A lack of fresh air (57 percent), insufficient natural light (49 percent), and an absence of indoor plants (36 percent) were the biggest source of frustration for employees. Introducing indoor plants (49 percent), nicer artwork (50 percent), and a more interesting colour scheme (54 percent), topped the list of employees’ requests to improve their workplace. Despite spending more time at desks than in bed, 80 percent said they regard a comfortable bed as very important, while only 53 percent placed the same level of importance on having a comfortable workstation. Yet the NHS suggests that excessive sitting can impact the body’s metabolism, affecting how we regulate sugar, blood pressure and breakdown fat. The study also explored the levels of personalisation in the workplace. UK workers are often very proud of the interiors of their homes, however almost 60 percent do not personalise their desk to make it more inspiring or comforting. One in five (21 percent) said their workplace has a policy preventing personalisation, and yet half of all respondents said they feel both more productive, and less stressed, when given the opportunity to personalise their workspace. Kenneth Freeman, Head of Innovation at Ambius said, “Human beings have an inherent need to connect with nature and green space. With workers spending so much time indoors, office managers need to be more aware of the impact the workplace has on wellbeing. Bringing elements of nature in to the workplace or enabling them to personalise their workstations has positive effects on performance, including increases in productivity, creativity and a greater sense of wellbeing.